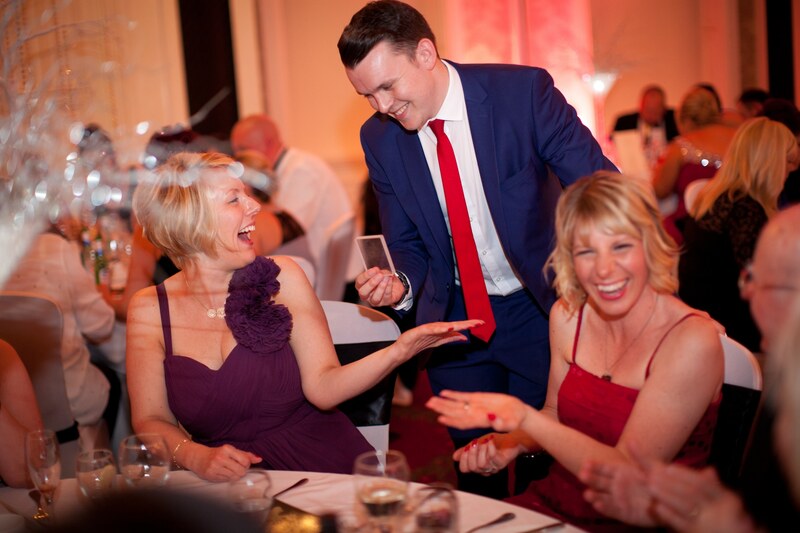 Get your party off to a flying start with my amazing close-up magic! Whether you’re planning a birthday, a black tie event, an anniversary, a house party or Christening, I’m sure to be a big hit! My performance is very versatile, suitable for all ages and I don’t require any allocated space; I’ll walk around and mingle with your guests. I’ve performed on the lawn during arrival drinks, at tables during dinner and in the living room at house parties. Although, I’ve never performed in the toilet! Whether I’m entertaining your closest friends, or flirty Aunty Sandra (yep, we’ve all got one! ), my performance is sure to wow them all. Using my quick wit and instant charm I’ll get to know your guests and adapt my performance to fit their personality. When I’ve left each group, they’ll go away feeling like we’ve known each other for years. If you’re hosting a house party, I’ve got a perfect solution for your entertainment. It’s called The Room. This unique style of magic involves using one room in the house that isn’t already being used for the party, for example, the dining room. Throughout the evening, five to ten people are invited into the room by the host for a complete surprise. In the room, I’ll provide my usual gold standard performance combined with a few extra special tricks that usually aren’t possible when walking around groups and solely relying on what’s in my pockets. The Room creates a great atmosphere of suspense at your party as it builds excitement for guests waiting to go in. Afterwards, the performances are always a fantastic talking point amongst your guests. One of the greatest benefits of using The Room is that no-one misses out on the action as everyone is invited, plus the fact that people are walking into a show makes it much more exciting than me walking up to them to perform. If you’re hosting a smaller dinner party or out for a private meal with family & friends, my grand close up experience will work an absolute treat. This performance style is suitable for a single table of up to twenty guests and involves two unique close-up performances of thirty minutes each between courses. My usual mix and mingle style magic only allows me to spend up to ten minutes with each group to ensure that I entertain as many guests as possible. My grand close up performance throws all the usual rules out of the window, allowing me to spend and hour with the same guests. This ultimately allows me to get to know everyone a little better, build a better rapport with each guest and provide a totally unique performance.